TransMIDIfier provides convenient MIDI routing and virtual instrument patch switching and customization for the working musician. TransMIDIfier works by functioning as a "middle man" between the sequencer and the sample player. TransMIDIfier reinterprets the incoming MIDI data in powerful ways before passing it along to the sample player. Switch among instrument patches from a single MIDI track via keyswitches or program changes, regardless of sample player. Selectively combine multiple, arbitrary instrument patches from different manufacturers to create powerful new sounds. 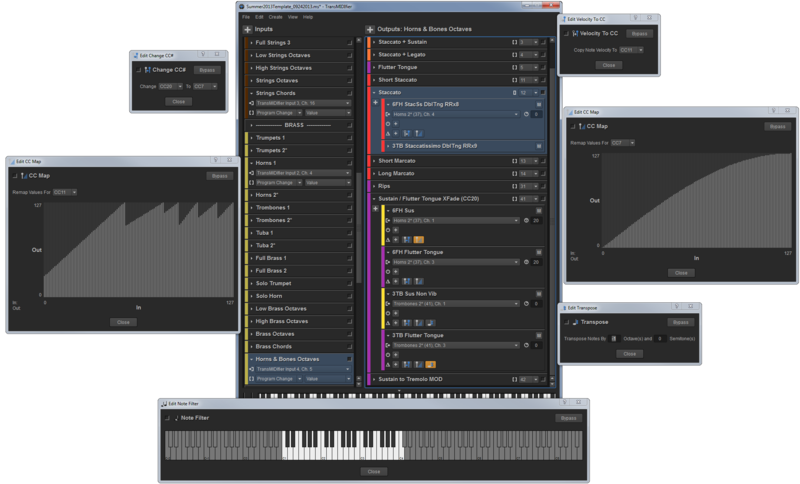 Apply transformations to MIDI data to customize instrument behavior and performance. Fixed bug causing improper saving & loading in Note Filter transform. Output activation method is now done on the input side. Outputs can be activated by controllers in addition to note on messages (keyswitches) and program changes. Outputs can be activated via value "ranges" instead of specific values. Patch delay can now be randomized up to a certain number of milliseconds. Click on the little "clock" icon to the left of the delay time entry box to toggle between constant and random delay time. When in random mode, the MIDI messages will be delayed randomly from 0 to the specified time in milliseconds. This feature can lend a great deal of "humanization" to quantized parts. Inputs and patches can now have their MIDI input/output set to "(none)", to effectively make the input/patch inactive. Previously a specific MIDI channel was required in all MIDI port/channel selectors. Now "Any" MIDI channel can be selected in inputs and patches. Ability to "merge" outputs. Patches from one input can be added to another according to output activation method or naming. The lowest note on 88-key MIDI keyboard (MIDI note number 21) activates the input that receives it. This is very handy to be able to see the available outputs without having to look around for the input being fed by the record armed MIDI track. In the future this "special event that activates an input" will be customizable. Many new keyboard shortcuts and much more extensive support for modifier keys. Two examples: Shift+ usually means "for all" and Alt+ usually means "from here on." More extensive support for copying, duplicating and adding inputs/outputs/patches (via right-click context menu). "Copy Output Descriptions" option in input right-click context menu places a textual description of that input's outputs (names, activation values/ranges) into the system clipboard. This can be used to easily notate the available outputs in a DAW track note area. Transpose transform now has an "octaves" entry. Multiple transform editors can now be open at once, and the locations of the editors are preserved. Close all transform editors at once by shift+clicking on one of the close buttons. New "Check For Updates..." menu item checks server to see if a TransMIDIfier update is available (Internet connection required). New progress dialog shows progress of file open and save operations. Fixed intermittent crash when opening setup files while MIDI is being processed. Fixed crash when attempting to reorder patches on Mac OS X. Fixed intermittent crash when renaming outputs or patches on Mac OS X. Lots of other little bug fixes. Windows: Save the .exe file, then double-click to run the installer. Mac: Save the .zip file, then unzip and place TransMIDIfier.app in your Applications folder. Double click TransMIDIfier.app to run, keep in dock if you desire. TransMIDIfier is provided free of charge, yet everything from writing and testing the code to hosting the releases on this web server costs money. If you've found TransMIDIfier to be a useful tool in your musical arsenal, please consider making a donation, via PayPal using the link below, in whatever amount you deem commensurate with the value it provides. Your support is much appreciated! Windows: Windows XP or later, 32- or 64-bit. At least one MIDI input and output device. A "virtual MIDI cable" solution will also be required for the most common use cases. loopMIDI is a great one. Mac: Mac OS X 10.6.8 (Snow Leopard) or later. At least one MIDI input and output device. One or more IAC Driver ports will also be required for the most common uses cases. TransMIDIfier is provided for your personal use, free of charge. The software is provided as-is, with no warranty implied or otherwise. Use at your own risk. Be Wary Software shall not be held responsible for any use, misuse, abuse, damage, or neglect caused by you or TransMIDIfier to yourself, your computer, your studio, your equipment, your friends, family, or pets. By downloading, installing, and using this software, you are agreeing to these terms. Enjoy. Found a bug? Got a feature request? Please email support@bewaryprods.com with as much detail about the issue and your system specifications, sequencer/digital audio workstation, samplers used, etc. Thanks!